Neville Borg (second from right) at this morning's Malta Model United Nations (MALTMUN) Society press conference at the Malta Chamber of Commerce. MALTMUN announced their upcoming conference 'Lives Adrift: Fighting the Exploitation of Irregular Immigrants’, which focuses on migration. 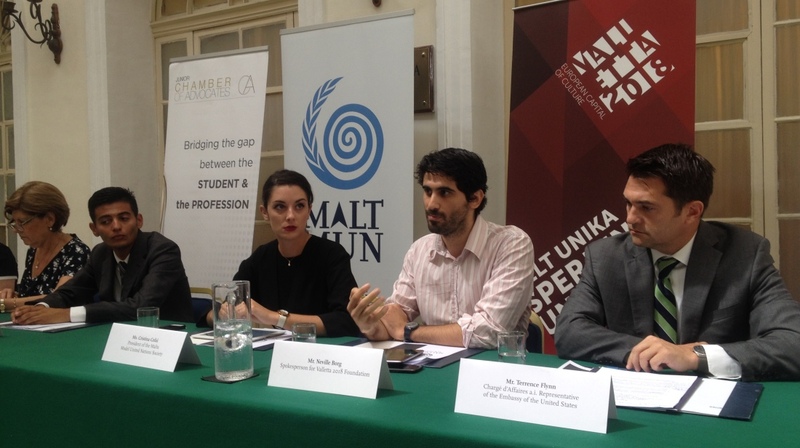 This morning, the Malta Model United Nations (MALTMUN) Society held a press conference Malta Chamber of Commerce, to launch their upcoming conference, in which Valletta 2018 participated. MALTMUN, together with the Junior Chamber of Advocates, is bringing Model United Nations to Malta for the first time through a conference titled ‘Lives Adrift: Fighting the Exploitation of Irregular Immigrants’, which addresses the plight that immigrants face while encouraging students and youths to debate related social and political issues. The conference is aimed at students studying at higher education level. Valletta 2018’s European Capital of Culture programme is built on two main pillars: one which focuses on Malta’s role within a wider European and international context, while the other addresses the issues faced by local communities such as social exclusion and poverty, among others. The MALTMUN project embodies this programme by encouraging students and youths to critically analyse and debate migration, one of the most pertinent socio-political issues of our time, in a humane and rational manner while linking it to a European context. Citing Valletta 2018’s Bid Book, Borg spoke about the Foundation’s vision of “expressing culture in Malta that breaks through insularity and isolation” and of the need to “explain and decipher the complex human issues and conditions that different identities and cultures bring about when they reside side by side”. These ideas are prevalent in Valletta 2018’s Cultural Programme which celebrates diversity through projects such as Valletta Living Together, a project carried out in collaboration with SOS Malta, which saw Valletta awarded the status of Intercultural City by the Council of Europe. “We strongly believe that bringing the Model United Nations seminar to Malta is another important step in our journey towards becoming the European Capital of Culture in 2018,” concluded Borg.